The Sons of Confederate Veterans group says the historical marker it wants to install on the Texas Capitol grounds simply explains an interesting and important part of Texas history. Reigniting a racially charged debate many thought had flamed out, the Texas Sons of Confederate Veterans association is working to install another historical marker on the Texas Capitol campus recognizing the Confederacy. “It’s nothing, frankly, that anybody needs to get their knickers in a twist about,” said Kirk Lyons, the group’s colorful lawyer. The organization argues that it is simply trying to highlight an interesting and important tale about how the Texas Supreme Court building came to exist through the use of Confederate veterans’ pension funds. Critics, including 12 lawmakers who fired off a letter Tuesday opposing the marker, say the group is making another attempt to glorify Confederate soldiers and revise the group's history of racism and slavery. The Sons of Confederate Veterans received preliminary approval in January to install a historical marker at the Texas Supreme Court building that commemorates the use of Confederate pension funds to erect the structure. 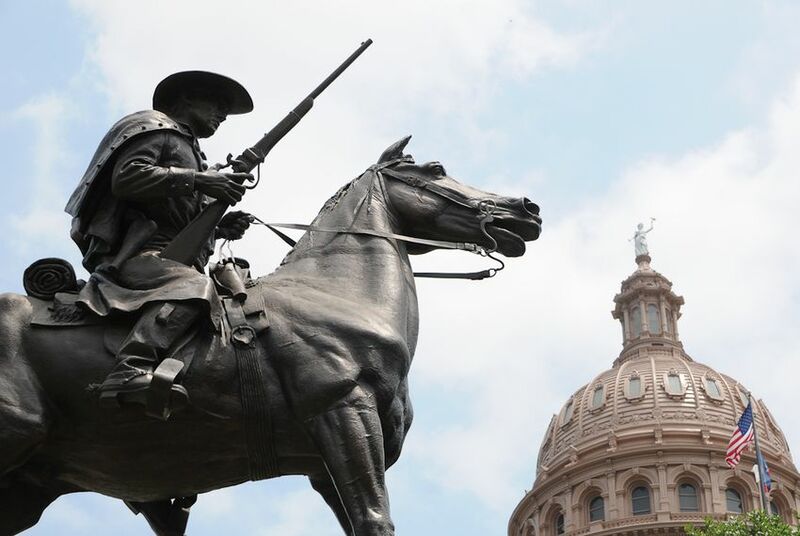 This week, though, the Texas Historical Commission informed the group that state law prohibits the installation of new markers on the Capitol grounds. With an official state holiday, an effort under way to secure an official license plate and at least three large monuments honoring the Confederacy already on the Capitol grounds, Ellis said, the losing side of the Civil War has gotten its due. The leader of the Texas NAACP said existing plaques at the Texas Supreme Court building already note the role of the Confederate pension fund in its construction. “There is not much more to say about this, and hopefully no efforts will be made to glorify the Confederacy,” said Gary Bledsoe, president of the NAACP of Texas. The latest effort comes after a 2010 court ruling in a decade-long legal battle between the state and the Sons of Confederate Veterans over plaques at the Supreme Court building. The back-and-forth over the Confederacy’s recognition has gone on even longer, and the lawsuit isn’t officially over. Lyons said installing the historical marker might finally end the fight. “It is a byproduct, but a very peaceful byproduct, of the ongoing struggle,” Lyons said. The group, he said, has not been informed that its application for the marker was denied. And he disputed the Historical Commission’s interpretation of the law regarding placement of monument on the Capitol grounds. Texas voters approved a constitutional amendment in 1954 that allowed money from the Confederate veterans pension fund to be used for new buildings. At the time, the number of living Confederate veterans had dwindled, and the funds were sitting idle. Meanwhile, the state bureaucracy was growing, and the Capitol building wasn’t big enough to house all the new agencies. Nearly two decades later, voters repealed the constitutional provision relating to the Confederate pension funds, and in 1979 the Legislature repealed the law dedicating the building to the veterans. The Sons of Confederate Veterans sued the state over the replacement of the plaques, arguing that the move violated the Texas Constitution and that it broke open-meetings laws and the government code. Granvel Block, commander of the Texas division of the Sons of Confederate Veterans, said the existing plaques are apologetic and don’t fully explain the story of how the building came to be. “The plaques that are there now are not something that acknowledges our ancestors,” Block said. In 2010, the 3rd Court of Appeals in Austin ruled that the new plaques did not violate any laws, but that the government code was not followed in the procedures to install the plaques. The court ordered the state to pay lawyers’ fees in the case. In a letter to Terry Keel, executive director of the Texas Facilities Commission, seeking permission to install the new marker, Lyons hinted that the marker could put an end to the litigation. “It is hoped that this Marker may clarify any confusion and help to diffuse any remaining anger or frustration over the dedication,” he wrote. He has a history of representing defendants accused of racially motivated crimes and has been labeled a “white supremacist lawyer” by the Southern Poverty Law Center, a nonprofit civil rights organization. In 1990, Lyons married the sister of a convicted member of the Aryan Nation, David Tate, at a wedding ceremony at an Aryan Nation compound. Lyons said the goal of the historical marker is simple: to explain how the court building was funded.